Mid Century Modern is a trending design style, but were you aware how much it influences todays design in most styles? Scandinavian, Boho Chic, Contemporary and Modern all incorporate Mid Century decor, styles and design choices. In fact, you can’t walk into a West Elm, open a decorating magazine or log onto Pinterest without seeing its influence. Including elements of this design style adds a freshness and a retro feel in the same moment. Clean lines and natural materials complement most homes and styles, especially smaller homes. In fact, rarely was an original Mid Century modern home built in the 1950’s over 1500 square feet. You can fashion your entire home design after high end Mid Century Modern architecture from Palm Springs, Phoenix, Austin, and Northern California. Or, you can just include a taste of it in your home for a modern touch. For instance, trendy “Boho Chic” style encompasses touches of MCM home style, woven together with clean walls and a feminine touch! 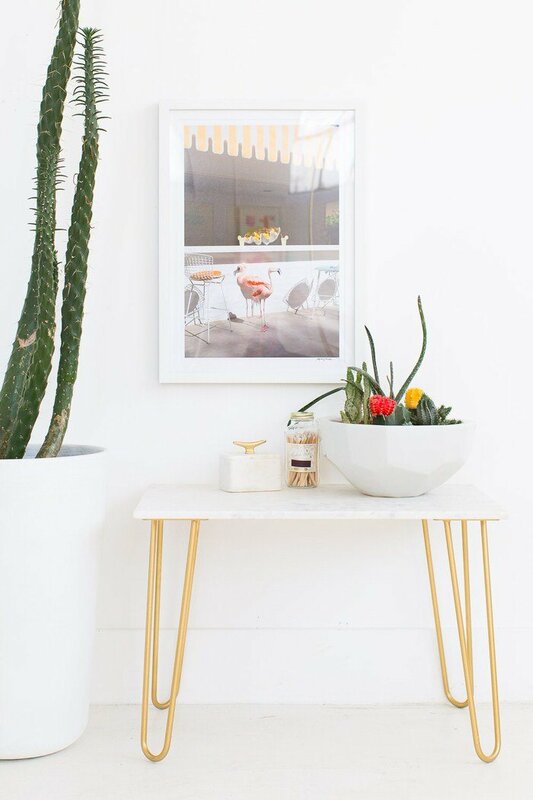 So check out all these wonderful Mid Century Modern Decor &DIY Projects! 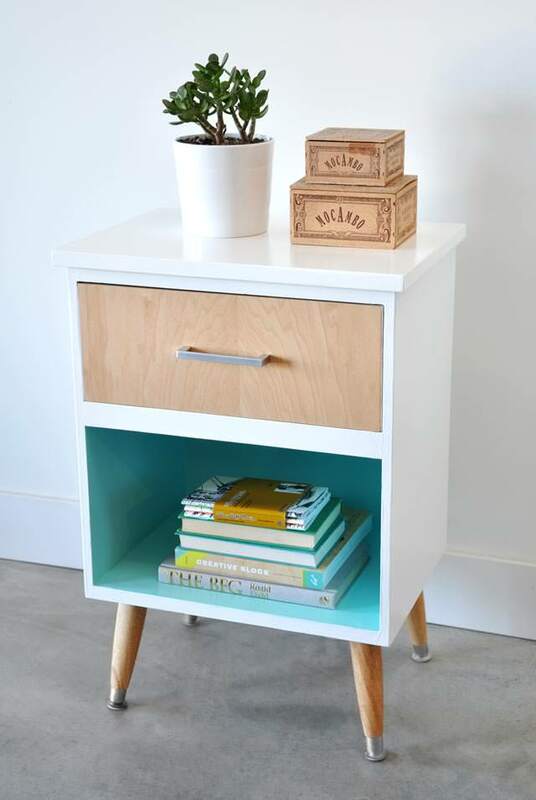 This Mid Century Modern nightstand from ‘Visual Heart‘ has a touch of the bright color that was a big part of design in the 1950’s, and traditional Mid Century legs. Keep your eye out at yard sales and thrift store for tables that have these legs. Even if the tables aren’t worth salvaging, the legs might be! Even reproductions of MCM legs are expensive now because they have become so popular. 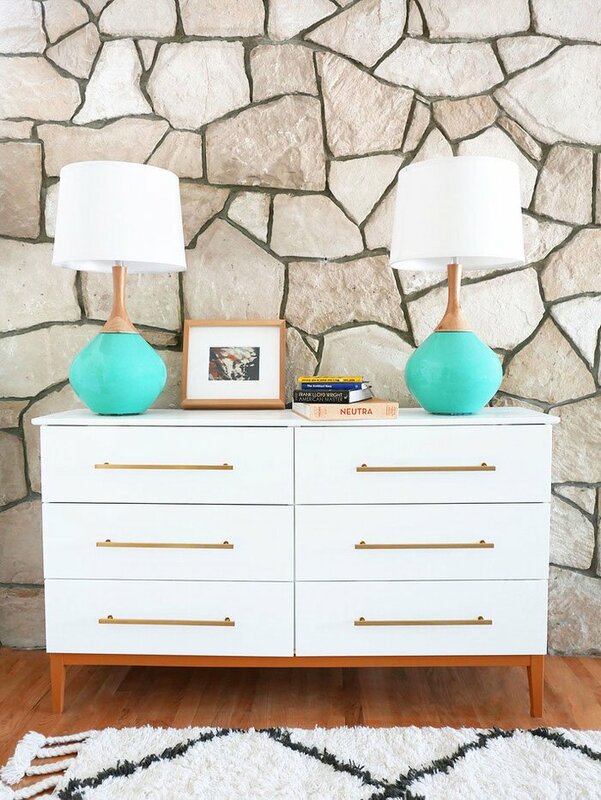 This next one is one of our favorite Mid Century Modern DIY Projects! 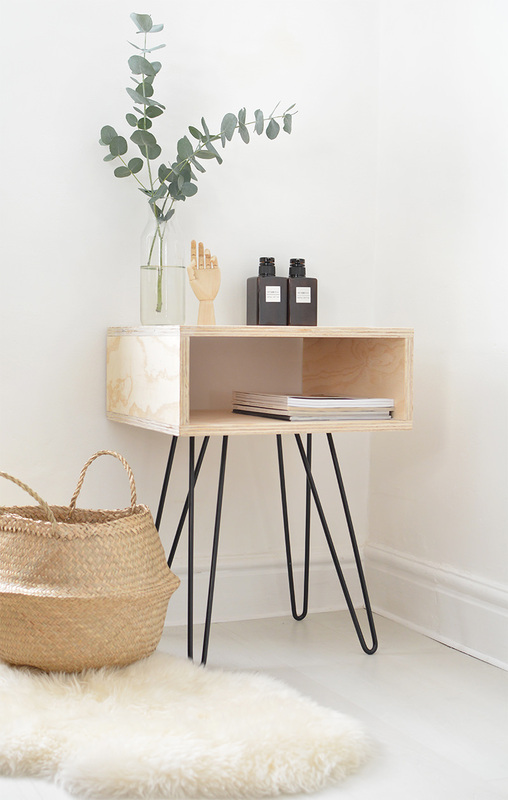 This DIY Mid Century nightstand from Caroline at ‘Burkatron‘ is exactly what this style epitomizes… Using the beauty of natural wood, streamlined hairpin legs and simple styling. What other design style could make plywood look high end? 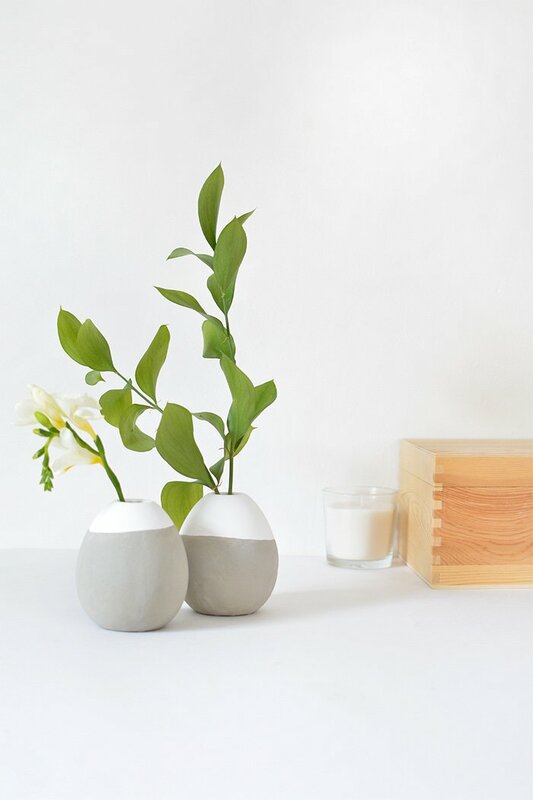 Also from ‘Burkatron‘ are these DIY concrete bud vases that lend themselves to Mid Century style. So fresh and inspiring! 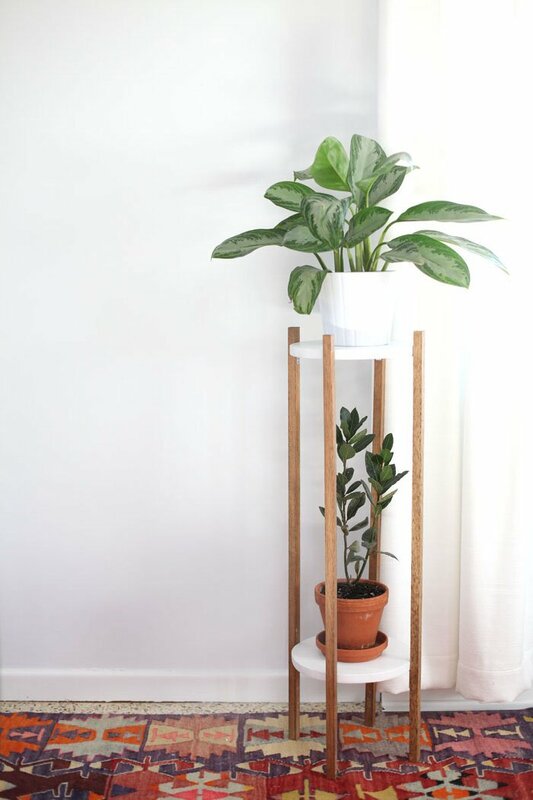 Via ‘A Beautiful Mess’, Mandi from ‘Making Nice in the Midwest‘ shows us how to make this Mid Century Modern plant stand. We are seeing these everywhere right now! And this is a pretty simple project anyone can do. We really like the Mid Century color scheme on this accent table from Raquel at ‘Inspiracionistas‘. 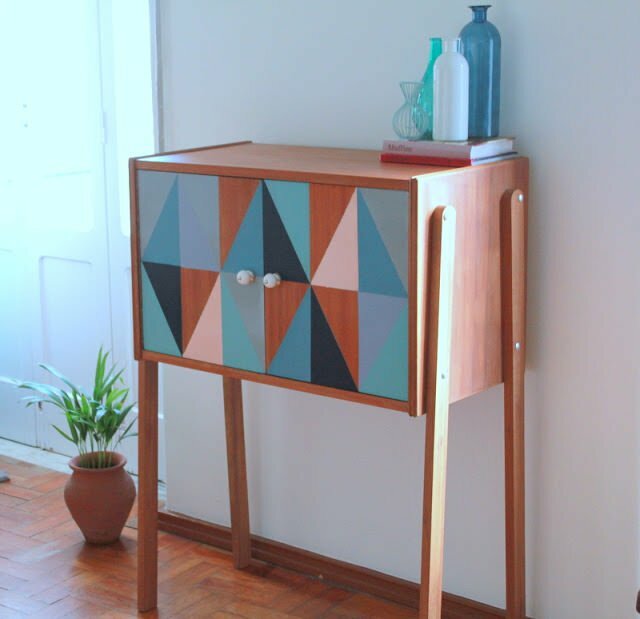 This site is in Portuguese, so you may need Google Translate, but its worth it for this DIY Mid Century entry table makeover. Check out these DIY sea urchin starburst sculptures from ‘Love Maegan‘. We’ve seen these wall art sculptures in a lot of modern and transitional spaces, and they can cost over $1000 if you want an original from the 1960’s. This is a crazy easy Mid Century decor project people, and inexpensive too! 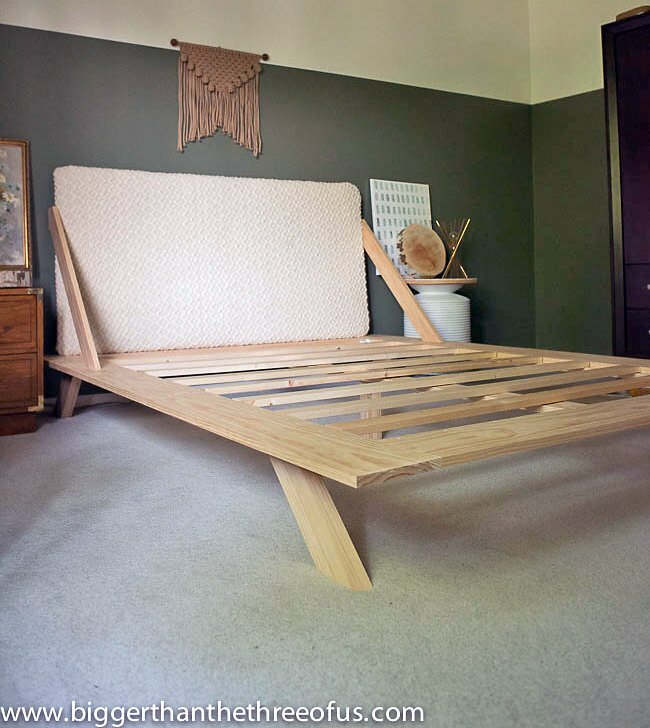 Ashley at ‘Bigger Than the Three of Us‘ was inspired to make this DIY Mid Century Modern bed by a CB2 piece that cost $900. She spent $175. That is a win! Lots of photos in this tutorial to help you make your own! 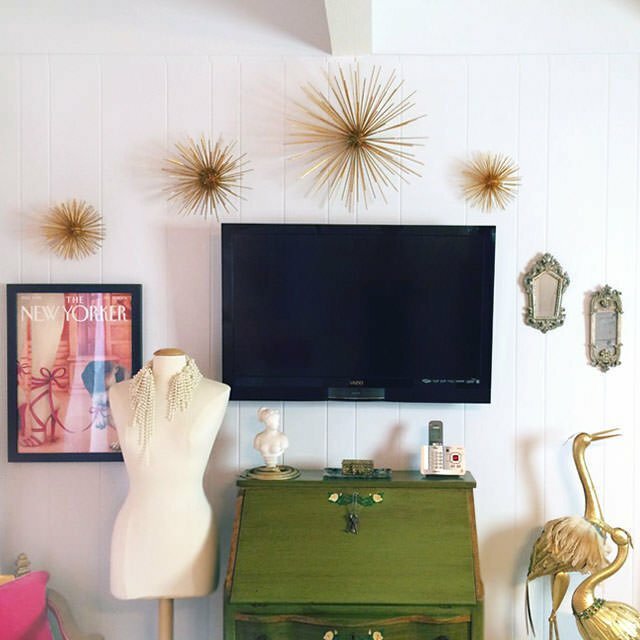 Annette from ‘A Vintage Splendor‘ knows her Mid Century Modern design… And she definitely knows how to hack an Ikea piece to create this Mid Century Modern Dresser DIY. She even tells you the exact paint she used! Another one of our favorite Mid Century Modern Decor Projects! Need a touch of the swanky 1950’s in your kitchen? 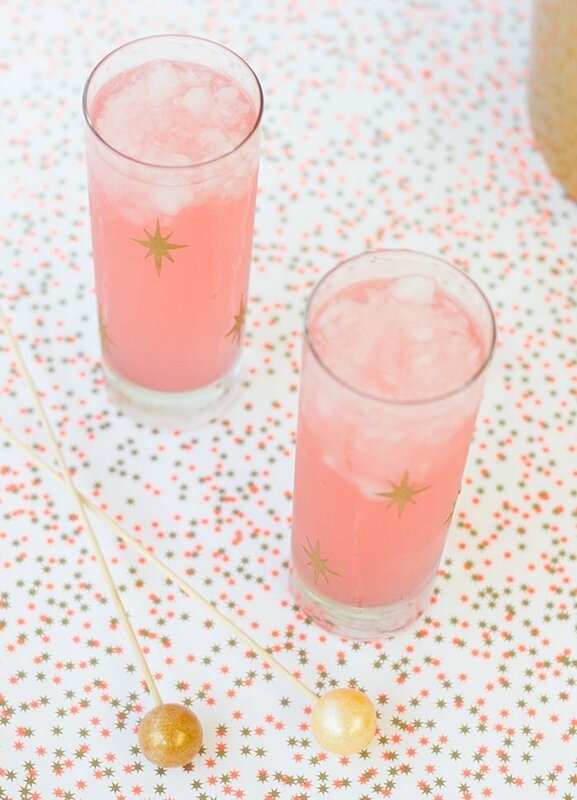 Make these DIY Mid Century Modern cocktail glasses with this tutorial from ‘Palm Springs Style‘. This is another really easy project that you can do in an afternoon, and have the bar cart ready that evening! 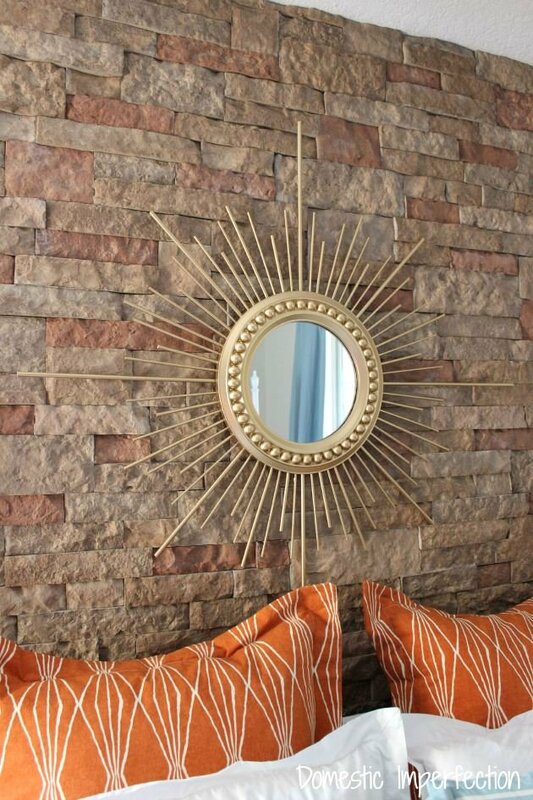 Ashley at ‘Domestic Imperfection‘ has a great tutorial for this DIY gold sunburst mirror. I love the detail on this, it really does look like you bought this MCM decor at an vintage shop! She spent less than $20 on this project. 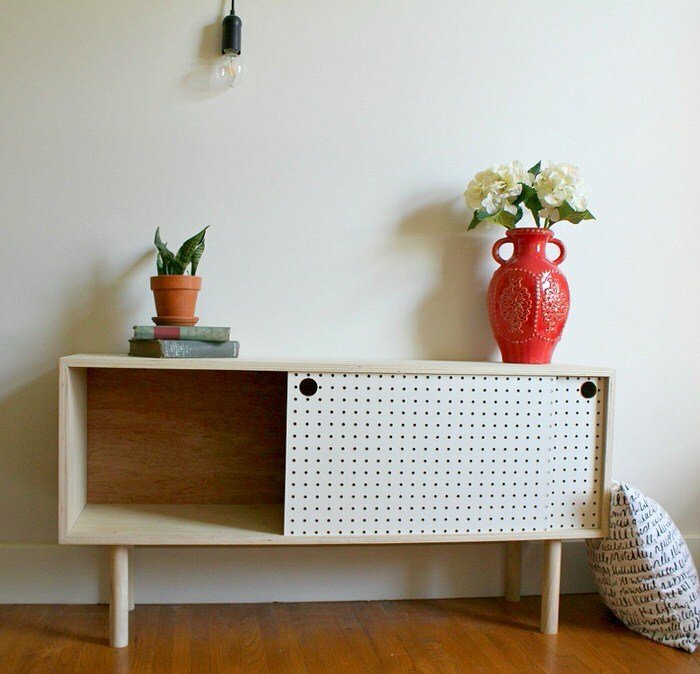 This Mid Century Modern DIY pegboard cabinet is the work of Shara over at ‘Woodshop Diaries‘. Her tutorial is very easy to follow, I really believe anyone can make this! Perfect for the retro fan. The legs do really make the piece, don’t they? 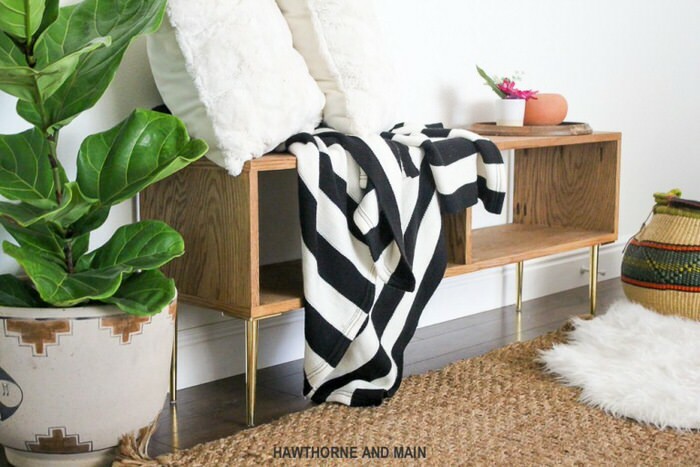 This DIY Mid Century Modern bench from ‘Hawthorne & Main‘ is the perfect entry or mud room accent. Great tutorial with lots of easy to follow instruction. 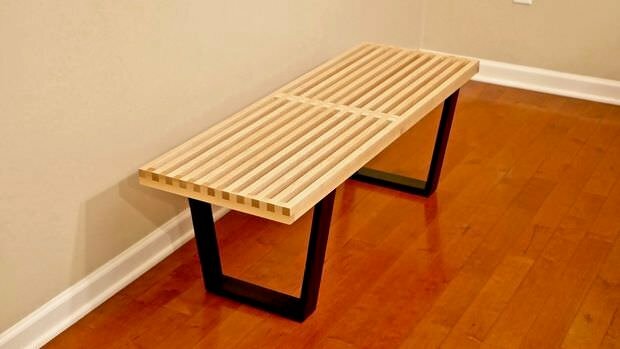 Or try this DIY Mid Century Modern slatted bench from ‘Instructables‘. This one has a more industrial edge, and we love these metal legs! This last one is for your living room. 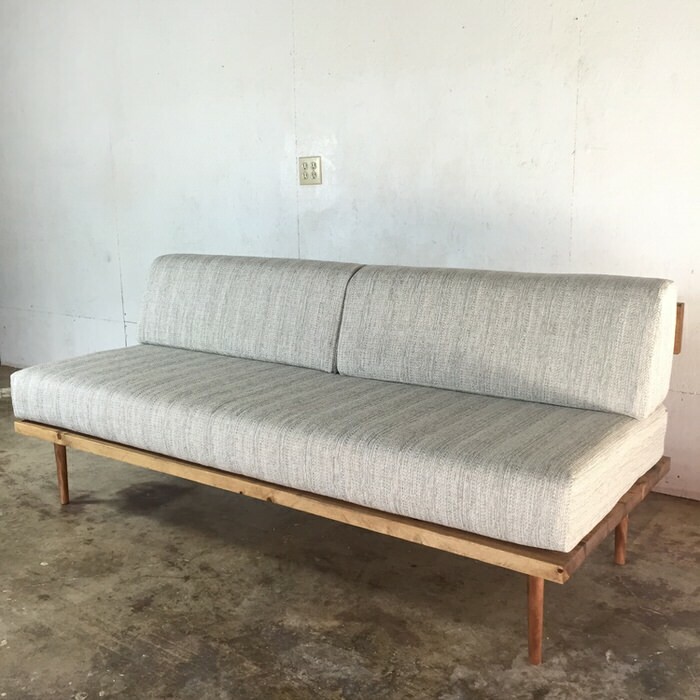 This DIY Mid Century Modern sofa is from ‘Modern Builds‘. You could easily recover old sofa cushions that are in good structural shape for this project, or have them made from foam and your choice of fabric. So forget modern farmhouse style, and come over to the vintage side of things! Which is your favorite? If you liked these Mid Century Modern Decor & DIY Projects, you might want to check out our post on plywood projects! Previous Post Trending DIY Mirror Projects!